A medical team is microscopically shrunken so they can pilot a submarine through a patient's bloodstream and clear a blood clot in his brain. If only we could shrink doctors to allow them to operate inside a human body. "Fantastic Voyage" is not the first film to use miniaturization as a key plot point, but it is the first to use it to explore inside the human body on a microscopic level. This film is directed by Richard Fleischer, who has helmed numerous projects including "20,000 Leagues Under the Sea," "Soylent Green," and "Tora! Tora! Tora!" It stars Stephen Boyd, Raquel Welch, Donald Pleasence, William Redfield, and Arthur Kennedy, who make up the crew members of a submarine that is to be shrunk to microscopic size. The crewmembers are going to be injected into the bloodstream of a scientist so they can remove a life-threatening blood clot from his brain. The crew has to work quickly since they can only stay tiny inside him for an hour. The only person who has figured out how to make the shrinking process last longer is the man who has the clot threating his life. As all of this is going on, everybody involved has to watch out for Russian spies because the Cold War is going on and those damn Commies are everywhere apparently. 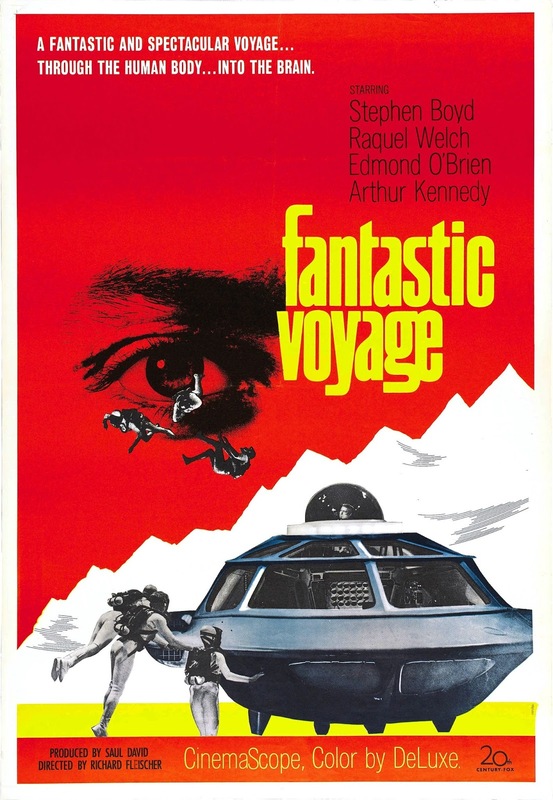 Back in the day, "Fantastic Voyage" was considered rather groundbreaking. It took home an Acadamy Award for Best Art-Set Decoration and Best Visual Effects. At the time, we are sure these effects looked amazing and were very hard to achieve with the technology that was available. That being said, today, the effects look more like a submarine ride through a psychedelic dance club than a legitimate travel through someone's bloodstream. Of course, those behind the scenes did the best they could with the knowledge they had at the time, so we can't really knock the movie much for it. Beyond that, the plot plays out like most sci-fi adventure films that take place in what seems to be a perilous alien-like environment. Instead of being attacked by actual aliens, the submarine crew is attacked by antibodies. Instead of trying to retrieve some MacGuffin from a treacherous terrain, they have to extract air from a lung, and so forth and so on. This movie has everything that would be considered cliche today, down to its race against a ticking time clock. Again, this probably wasn't a big problem at the time, but it speaks to the fact that the film doesn't hold up well today. In the end, "Fantastic Voyage" is an only mildly entertaining, painfully dated sci-fi adventure film that doesn't hold up quite as well as others like it. Many viewers will remember it fondly and enjoy it for the nostalgia factor, but to us, nothing stood out about it. Heck, even the acting isn't very good.